This page you are viewing now is a tribute to a guy by the name of Harry Houston. Harry was a friend of mine and unfortunately he passed away on June 25th, 2009 at the age of 43. I went to school with his brother Brian and later found out that Harry was a huge wrestling and Ric Flair fan. Then in the early 90's when I used to order all the wrestling pay-per-views I would have many of my friends come over to watch the matches and Harry would always be there and he would always help me out in paying for the events, his brothers Brian and Joe would come over too but not as much as Harry, this went on for several years and now looking back I cherish those memories more then I ever have. I know when someone passes away it seems as though everyone always says good things about them but with Harry it is all true because he really was a great guy and a special person. Unfortunately in the last few years I didn't see him that often but I will always remember the last time I seen him which was in Elkin, N.C. at Schewels Furniture when Ric Flair came through for a autograph signing last February. 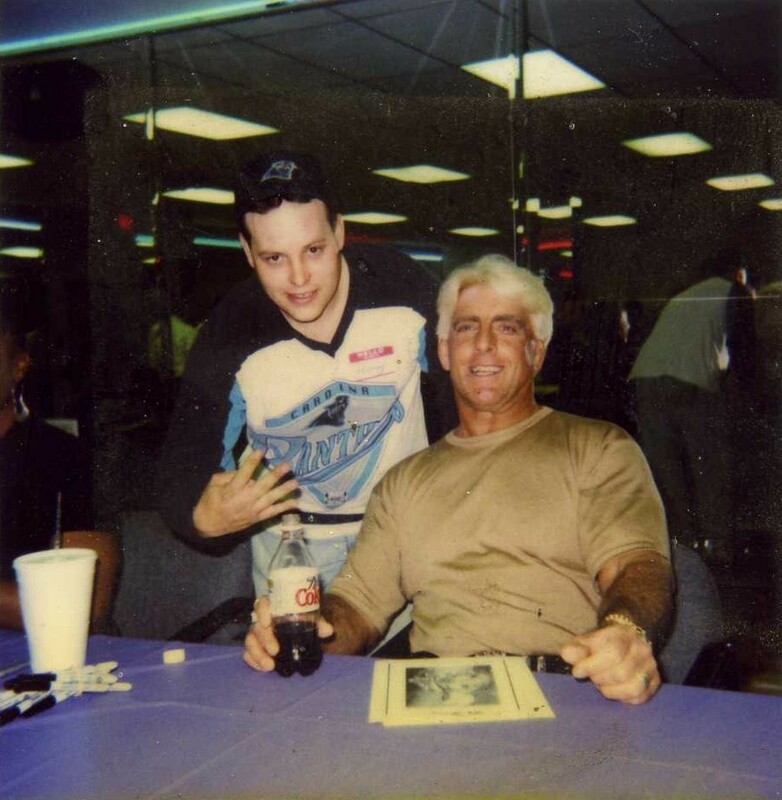 He had his son Brandon with him and they were in line getting ready to meet Ric Flair, they barely made it in to meet Ric but that is a story I am going to let Harry's brother Brian tell in the article below. I am going to end this by saying that I will miss Harry and I hope that this tribute that I am doing for him on my website will bring a little comfort to his family and friends. He was a great guy and he will be missed. Please read the article below from Harry's brother Brian and then after you read that scrool down the page to see Harry with Ric Flair when he met him back in 1998. My brother Harry was one, if not the biggest, wrestling fans EVER. This past Monday was the first time in many, many, many years that he was not in front of the TV watching his favorite program of all time. Sometimes I would joke with him and say if I die I told my wife (Tara) not to have my services on Monday because I want Harry to be there. The last time I made the joke, he put his arm around my neck and said "I can always record it". Harry was like many of us wrestling fans around this part of the states, a big Ric Flair fan. I have known David Matthews for many years and so did Harry, I think we both knew he is the biggest Flair fan.. 4 or 5 years ago, Harry had got me an action figure of Ric. It was the classic one with the long hair and the red robe. I had kept it put up until a short time back when Ric made a stop in Elkin to meet with fans and Harry had it signed for me. I believe he told me over a 4,000 fans were there. I cant recall how many Harry said made it in but him and his son Brandon was the last ones they let through. Harry told me that everyone that was behind him just filled his arms with stuff to get signed. He said that Ric was picking with him about how much stuff he had. Harry told him that this is what happens when youre the last one in. Everything that was handed to him he got signed for the folks. I wanted to put this on here for him and for those who were behind him in line that day. If you were one of those folks, you seen first hand what a great guy my brother was. If there was anything he could do for someone he would, even someone he had just met in line. Thanks for taking the time to read this story. I will miss him every day.